The Black Manhattan is a simple variation on the classic formula: substitute an Italian amaro for the sweet vermouth. Presto! Black Manhattan. 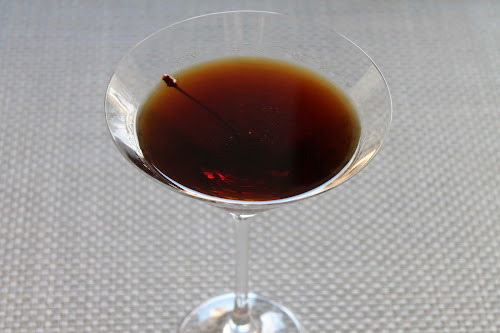 Amari (the plural of amaro) are Italian herbal liqueurs with complex sweet and bitter flavors. Using an amaro makes for a wonderful Manhattan that's both more bitter and more sweet than usual. Many amari have a higher alcohol content (30 to 40 percent) like a liqueur you'd keep in your liquor cabinet, although some have less alcohol (15 to 20 percent), more like a fortified wine, and should therefore be refrigerated. Credit for this drink goes to Todd Smith, bar director of the Bourbon and Branch bar in San Francisco. 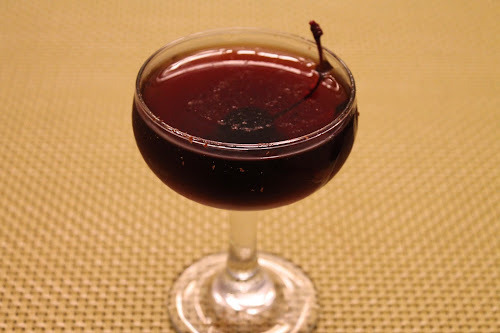 For a wonderful variation on the Black Manhattan, I heartily endorse the Elijah's Railcar (pictured above). We encountered this drink at the CU29 bar in Austin the other week, and it was hands-down our favorite cocktail of the trip. It's a wonderful riff on the Black Manhattan with a touch of honey and an aromatic finish of freshly grated cinnamon. It's a perfect drink for the upcoming holidays. Although not on the bar's menu, I asked the bartender what was in it. The measurements below are my own, but the technique was hers. I haven't been able to find a recipe for this drink online, but what I have found suggests it originated at the Soho Cocktail Bar in San Antonio, Texas. In a cocktail mixing glass, combine whiskey, amaro and bitters with ice. Stir until very cold, about 30 seconds, then strain into a chilled cocktail glass. Garnish with the cherry. 1. Pour a tablespoon of honey liqueur into a coupe glass and swirl to rinse the glass. Dump out and repeat. 2. In a cocktail mixing glass, combine rye whiskey, amaro and bitters with ice. Stir until very cold, about 30 seconds, then strain into the liqueur-rinsed coupe. Garnish with a bing cherry and freshly grated cinnamon. Note: You can buy honey liqueur, but it's easy to make. For a small quantity, combine 3 tbsp. honey and 2 tbsp. water in a microwave safe container (like a glass Pyrex measuring cup). Microwave on high for 15-20 seconds, remove and stir to combine. Add 1/2 cup vodka and stir combine. Store in the refrigerator.